This landed on the doormat today. 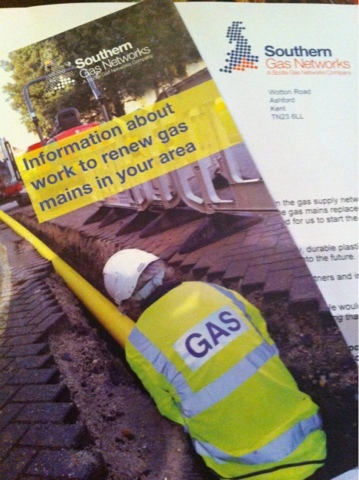 Notification of planned work to replace the gas mains in our area, taking place over the next eleven weeks. There's a rather worrying section in the letter which says they may need to replace the pipe on our property and they may need to move the gas meter. Right, that's currently in the kitchen that's being replaced in the next two-three weeks. I think I may need to phone the team leader who so kindly wrote to us to find out how/when they will know how we'll be affected!